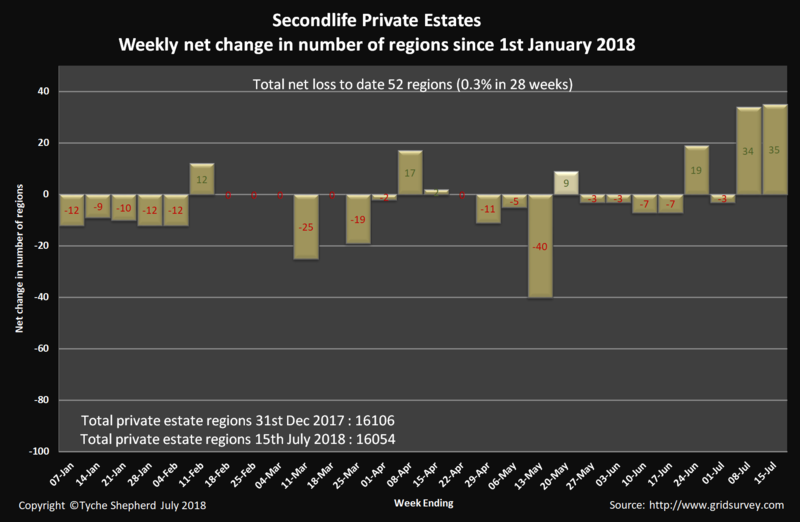 On Sunday 30th December 2018 Tyche Shepherd posted up the last Sunday report for 2018 showing positive growth numbers for Second Life regions throughout 2018. 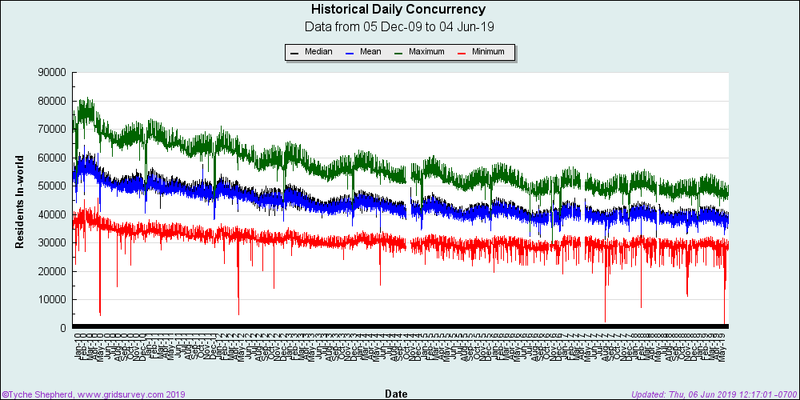 Apparently for the first time in seven years the Second Life grid is bigger at the end of the year than it was at the start. The last time this happened was back in 2011 which seems a long time ago now. The total number of Main Grid regions as of 30th December 2018 stands at 23, 811 with (16, 120 being Private Estates and 7, 691 being Linden owned. I think the changes that Linden Lab made for land costs has definitely helped along with many other factors. It would be great to see the Second Life grid growing even futher during 2019. Let’s hope this growth trend will continue now for the rest of 2019. This is very good news to hear positive growth for private estates in 2018 so far. I think the summer price reductions on land this year in Second Life has made a positive difference this year. The grid is slowly growing again and I hope this trend will continue. As of 30th September 2018 there have been 56, 326, 674 signups for Second Life to date. After some brainstorming sessions and discussions it’s been officially decided by the Relay For Life of Second Life organisers that Relay Weekend will be moved a month earlier going forward. The 2019 season will last for 16 weeks and it will be very different compared with previous years. The Relay For Life of Second Life 2019 season will now kick off at 10am SLT on Saturday 16th February 2019 and the annual Relay Weekend will be on Saturday 8th and Sunday 9th June 2019. This is the first time in Relay For Life of Second Life history that the event will be held in June instead of July. The economic metrics say that having the relay season earlier means more residents will be active and will be logged in. Both Relay Weekend and the Second Life birthday will now take place in June which means it’s going to be a rather busy month. For the past two weeks net private regions have increased by 69 since the new pricing structure for private regions came into an effect. This is very good news and shows there is still interest in buying private regions in Second Life at the moment. It’s worth mentioning that when the grid grows it really does help slow the overall rate of private regions losses on the grid. Tyche Shepherd mentions the net private regions growth in the latest grid report, see below. 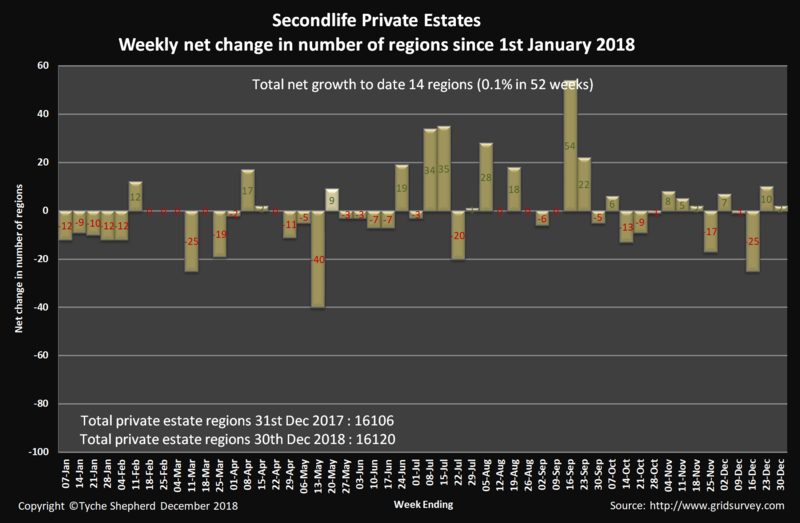 Net Growth stands at 35 regions this week (last week was 34) All this week’s net growth was among private Estates . I’ve no record of Region type at the moment, and therefore no estimate of overall change in revenue for the Lab, but the initial change in demand doesn’t seem enough to increase overall revenue at this stage. It would be great to see more net growth in private regions in the weeks and months ahead. 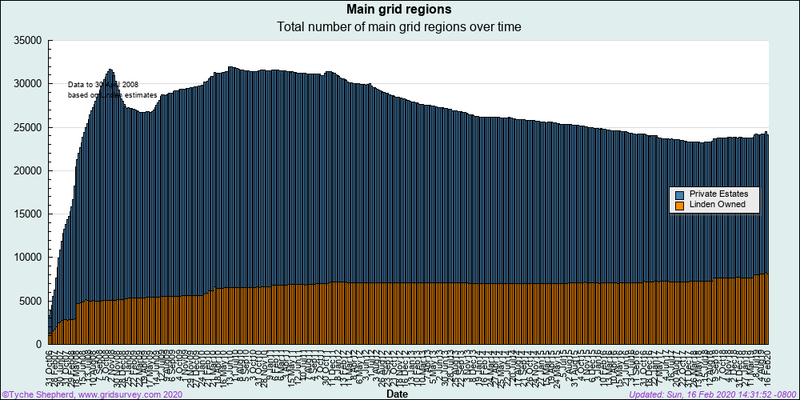 The grid needs to grow again as it’s been on the decline for many years.